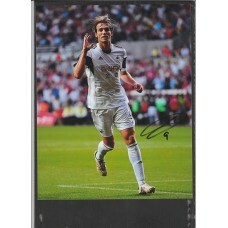 Home » Signed photo of Michu the Swansea footballer. Miguel Pérez Cuesta otherwise known as Michu. This a fabulous 8 x 10 colour photo signed by Michu the Swansea footballer. This photo shows the Swansea striker celebrating another goal and has been very nicely signed by Michu in fine black pen. Michu played for the Swans between 2012 and 205 playing 52 leagues games and scoring 23 times. He also won one full cap for Spain. A great item and well worth £4.99.